Puma Suede Classic Sneakers. Don't buy size 13. via Lord and Taylor (!). $64.95. Q: Hi. I like old school Nikes (Jordans), Asics, Adidas and so on. 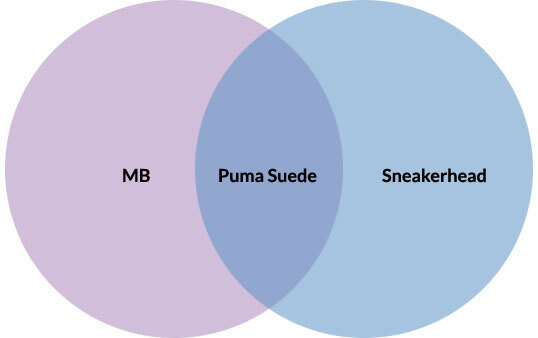 Is it MB to be a sneakerhead? I assumed it wasn't. Am I correct? To paraphrase Craig Finn, certain brands they get so scratched into our souls. And when we really start thinking about it — and we have been, because of your question — we realize that many of the brands that have been scratched into our souls (and, yes, soles) deepest and longest are sneaker brands. It's possible we were introduced to McDonald's, Mars, Inc., and Coca Cola earlier than we were introduced to Puma, Adidas, Pony, and Converse. These days, however, we go years without a Big Mac, months without a Snickers bar, and sometimes even a week without a Coke. Whereas we believe that there is probably no 72-hour period over the course of our post-toddler lives where we have not worn one of the aforementioned brands for at least a couple hours. And of course those brands have company in our overall collections — a quick assessment of our three nearest closets nets approximately 140 pairs of sneakers from roughly 30-plus brands, with heavy emphasis on Golden Goose, Tod's, Diemme, and Maison Margiela. That said, we've never owned a pair of Air Jordans, much less cleaned them with a toothbrush. So are we sneakerheads? 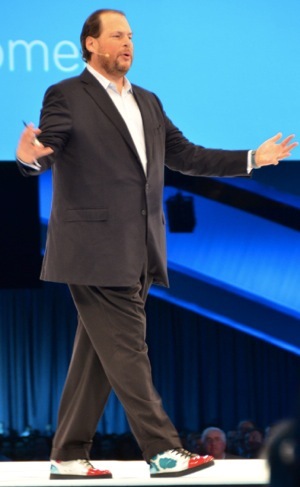 As we understand the term, sneakerheads seem to focus on (a) shoes that NBA superstars and other professional athletes might credibly wear in regulation play, (b) shoes that Captain America might go jogging in, or (c) shoes that Marc Benioff might wear while delivering a keynote address at Dreamforce. While we can embrace option (a) in limited contexts — we're not going to play tennis in our Maison Margielas — options (b) and (c) don't appeal to us under any scenario. Instead, we stick to vaguely businified sneakers — i.e., sneakers we could wear to work without, as we've said in the past about sweatpants, making our colleagues wonder if we're about to dunk on them. Just Wondering ... Does Barack Obama Have a Covert Sponsorship Deal With Nike? First Obama killed Osama bin Laden sporting a Nike golf jacket, now he's negotiating debt ceiling deals with golfing partner John Boehner in a Nike golf shirt and Nike golf socks. One logoed Nike thing at a time, Mr. President, or you'll blow your cover! Also, if you won't trim the budget, can you at least right-size your shirt? We're pretty sure Paul Ryan would try to make a week's worth of garments out of that blousey tent you're wearing. Meanwhile, in spectacular un-fashion, Rory McIlroy lifted the Oakley curse by being the first Oakley-sponsored player to win a major championship. Earlier: Camelnot. Obama vacationing in Martha's Vineyard. In what no doubt qualifies as the greatest product placement of all time, President Obama shows off the business casual versatility of a Nike golf jacket (model not yet identified). He started the day wearing it at the Andrews Air Force Base golf course, where he got nine holes in before cutting his game short to set up camp in the White House Situation Room and watch U.S. forces take out Osama bin Laden. This was reportedly the fifth weekend in a row the President spent golfing. Given the outcome of the mission in Pakistan, we think he — and everyone else involved — earned the right to play a full eighteen this weekend.